If you are living in any of below mentioned 29 countries then you have option to receive you payment by EFT. Simply follow the instructions to receive payment by EFT. Hope this information related to EFT for Google Adsense will help you alot. (1) Click on "Edit Posts" from your blogger dashboard. (2) You will see two options "Edit" and "View" near to your blogger posts. (3) Now If you want to copy link location of any of post then Right Click on the "View" (near to your blogger post) and copy link location using mouse. For example: I want to copy link location of my one of post and I do not want to open my blog. Then I will click on the "Edit Posts" from dashboard. Hope with this method you can easily copy link location of your blogger post without opening your blogger. Forum are the greatest way to boost your website traffic and If you have a Wordpress blog and want to integrate Forum with your Wordpress blog then bbPress in best option for you. What is bbPress Forum ? bbPress (open source) is plain and simple forum software. It’s easy to use, easy to administrate, fast and clean. For adding bbPress in your blog you need very small part of coding. How to Integrate bbPress Forum with Wordpress Blog ? You can integrate bbPress plugin with 5 minutes. 2. Place the 'bbpress' folder in your '/wp-content/plugins/' directory. 4. Visit 'Settings > Forums' and adjust your configuration. 7. Adjust the CSS of your theme as needed, to make everything pretty. What are the Requirements for Adding bbPress in Wordpress blog ? Hope you will like this bbPress open source software and will easily install this software in your blog. One of my friend make a blog in blogger but he did not like that blog and want to delete that blog. Unfortunately he could not found the option for deleting a blog because he is not much familiar with blogger, Then he ask me on phone I advise him how easily he can delete his blog. If you make a blog lets say 'xyzabcexample.blogspot.com' and want to delete this blog then you can check the following steps for deleting a blog. (a) Log in to Blogger dashboard. (b) Select blog which you want to delete. Google Chromebook is available with Samsung and Acer. You can buy these chrome book in your coming holidays. Meta tags (Title Tag and Description Tag) are very useful for SEO purposes, Search engines specially Google, Yahoo and Bing are giving very importance to meta tags. By default blogger has 'title tag' but do not have 'description tag'. So for adding meta description tag you can use the following steps. Change "Your Description" to "your website description (which is describing your website)"
* You can also add other meta tags. Note: Do not use "&" symbol in your description, If you want to use "&" then use only "and" because "&" may give you error for saving your template. Did you launch a new website ? and want to optimize your new website and looking for SEO tips for promoting your website then here you can find some SEO tips provided by Bing on their Webmaster Center Blog. Site Structure: Site structure of website should be good and readable by search engine and users. Hope these SEO tips will increase your website's SEO rankings. This time PR has given surprised to all webmasters across the world. Basically websites got decrease in some PR. Did you notice Page Rank of your website ? Many professionals were saying page rank is dead but I think page rank is not dead because page rank is regularly updating after very short interval of time (Page Rank on 27th June 2011 and Page Rank on 4th August 2011) and now on 7th November 2011 page rank is happened and its prove page rank is still active and Google is giving importance to page rank. I noticed many websites has decreased in page rank. I found some of big portal got -1 in their page rank. Did you notice any website having PR 10 other than http://www.usa.gov ? Do You Know Blogger is Available with 41 Languages ? Blogger is product of Google and a blogging service. You can easily create your blog even if you do not know about basic HTML. There are many best features in blogger but I think one the major feature of blogger is that you can make a blog in 41 available languages. Main languages are English, Hindi, French, Italian, German, Spanish, Dutch, Portuguese, Chinese, Japanese, and Korean. Arabic, Hebrew, and Persian. The all 41 languages are available with blogger and you can write your post with these available languages. If you want to make your blog in Hindi or french or any of other language i.e. is available with blogger then you can easily make your blog in your preference language. Keep Blogging and write useful posts. Happy Blogging ! Get Free Domain Name and Hosting - How to Make a Website for Free for Promoting Your Business ? 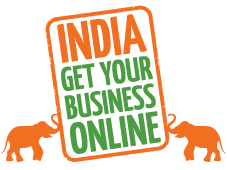 After filling the simple form available at here www.indiagetonline.in you will get a design mode for designing your website and you can choose various template according to your business. After one year you have to pay some charges according to some FAQ's give at the website related to free domain name registration and hosting services. At the India Hackathon 2011, help us improve access to Wikipedia and Wikimedia's other projects across all languages, via mobile devices, and for people without Internet access! About Wikipedia Hackathon 2011: Hackers of all backgrounds are welcome and prior experience with the MediaWiki software is not required. Translators with a linguistic background who can help improve language support for Wikimedia technology projects are also welcome. This coding event will happen concurrently with the WikiConference India 2011, and near its venue. About 100 to 150 participants are expected. I already write a post about Logo1w Today, I found www.google.com/intl/en_com/images/srpr/logo2w.png & www.google.com/intl/en_com/images/srpr/logo3w.png are also available and these are the URL of the logo of Google. If you will try to open the above said URL in your browser then you will found the Google Logo. All these logos i.e logo1w, logo2w and logo3w are same and there is no any difference between these logo and my question for writing this post is that Why Google is using different logo's name for one logo ? Hope, only Google can answer this. Did you ever notice these three different URL's for same Logo of Google ? You can share you views about Google Logo at here. If you are a blogger and have a blog on blogspot.com and want to give permissions to any person for guest posting then there is very best option for you. You can invite maximum 100 authors (persons) for writing content for your blogger. I think its very best option because by doing this your blog may get some unique content. How You can Give Permissions to Someone for Writing Posts ? Its very easy you can easily give permissions for writing posts to your friends or someone else. By this way you can invite someone for guest posting for your Blogger. Do you have a facebook fan page ? and you want to make admin to someone or your friend for facebook fan page then their is a option for you. You can make your friend an admin to your facebook fan page. (1) Go to your Facebook Fan Page. When you will click "save changes" then your friend will receive an email regarding you are now admin to your facebook fan page. Do you Know Aakash Tablet 2 is Coming in February 2012 ? You may already know about Aakash Tablet (Aakash, World's cheapest tablet computer) which is launched by Indian Government. I think its very good opportunity to buy Aakash Tablet specially for the students. This year Doodle 4 Google received 155,000 entries from across the country and only 45 finalists are chosen by Google from the following class. You can also vote for your favourite doodles. Best Wishes to all 45 finalists. My India which is growing technically and naturally is a great support to all beings in India. Non other countries can match up to India's level in the coming years. It's achievements are taking it to the top of the world. How To Make Custom Templates Compatible With Pages Tabs in Blogger ? 8. Go to Design | Page Elements and look for the new horizontal Gadget area and add the Pages gadget there. With which part of computer in the advertising slogan Intel inside associated ? Obviously, the answer is (d) Processor, but that Computer Operator did not know about this answer and He take his life line audience poll. What is Special and Why I Write this Post ? Actually, that person won Rs. 5 Crore and He is a computer operator and earning Rs. 6000/- per month only and may be the 1st Indian who won Rs. 5 Crore on any Indian TV channel. On Firefox, I found there is some problem because Number of results is not at the right place. In above image you can see "About 13,270,000,000 results (0.26 seconds)" is below the line. I think Google is testing it right now on Firefox. On Chrome everything found corrected see the image above. Did you Like These New Buttons ? Did you like this change made by Google ? If you want to share your views about these changes then you can give your valuable comments.